One of my lovely couples, Alicia and Tony (getting married May 2012!) were so sweet as to invite me to their engagement party, which was SO. MUCH. FUN. I mean, how can you go wrong with great people, the P. Terry’s truck, cupcakes, and bocce in the backyard? You can’t. That’s the answer to that question. Anyways, inside, burning on the coffee table was an amazing candle that I immediately became obsessed with, so I wanted to share! 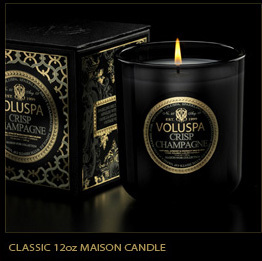 Voluspa candles smell beyond fantastic. My fave is the Crisp Champagne, but honestly, they’re all pretty amazing.